There are more than 10,000 cross references between the Bible and the Urantia Book. Part IV, a New Revelation of Jesus, is a 774 pg. section which has many parallels to the Gospel stories of the Bible. This blog will be a study of such parallels, and hopefully will increase and expand the love of those already familiar with the Gospel stories of Jesus, or, conversely show the Urantia Book's New Revelation equivalents of Gospel stories. It is a great pleasure to post this momentous occasion, and as usual, the Bible and the New Revelation accounts are synonymous, with more detail in the New Revelation. This extra detail provides a setting, insight into the minds of the apostles, and more of Jesus’ explanations. 157:3.1 Early Tuesday morning Jesus and the twelve apostles left Magadan Park for Caesarea-Philippi, the capital of the Tetrarch Philip's domain. Caesarea-Philippi was situated in a region of wondrous beauty. It nestled in a charming valley between scenic hills where the Jordan poured forth from an underground cave. The heights of Mount Hermon were in full view to the north, while from the hills just to the south a magnificent view was had of the upper Jordan and the Sea of Galilee. 157:3.2 Jesus had gone to Mount Hermon in his early experience with the affairs of the kingdom, and now that he was entering upon the final epoch of his work, he desired to return to this mount of trial and triumph, where he hoped the apostles might gain a new vision of their responsibilities and acquire new strength for the trying times just ahead. As they journeyed along the way, about the time of passing south of the Waters of Merom, the apostles fell to talking among themselves about their recent experiences in Phoenicia and elsewhere and to recounting how their message had been received, and how the different peoples regarded their Master. 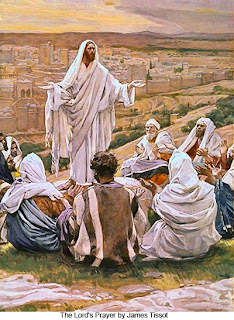 157:3.3 As they paused for lunch, Jesus suddenly confronted the twelve with the first question he had ever addressed to them concerning himself. He asked this surprising question, "Who do men say that I am?" 157:3.4 Jesus had spent long months in training these apostles as to the nature and character of the kingdom of heaven, and he well knew the time had come when he must begin to teach them more about his own nature and his personal relationship to the kingdom. And now, as they were seated under the mulberry trees, the Master made ready to hold one of the most momentous sessions of his long association with the chosen apostles. 157:3.5 More than half the apostles participated in answering Jesus' question. They told him that he was regarded as a prophet or as an extraordinary man by all who knew him; that even his enemies greatly feared him, accounting for his powers by the indictment that he was in league with the prince of devils. They told him that some in Judea and Samaria who had not met him personally believed he was John the Baptist risen from the dead. Peter explained that he had been, at sundry times and by various persons, compared with Moses, Elijah, Isaiah, and Jeremiah. When Jesus had listened to this report, he drew himself upon his feet, and looking down upon the twelve sitting about him in a semicircle, with startling emphasis he pointed to them with a sweeping gesture of his hand and asked, "But who say you that I am?" There was a moment of tense silence. The twelve never took their eyes off the Master, and then Simon Peter, springing to his feet, exclaimed: "You are the Deliverer, the Son of the living God." And the eleven sitting apostles arose to their feet with one accord, thereby indicating that Peter had spoken for all of them. 157:3.6 When Jesus had beckoned them again to be seated, and while still standing before them, he said: "This has been revealed to you by my Father. The hour has come when you should know the truth about me. But for the time being I charge you that you tell this to no man. Let us go hence." 157:3.7 And so they resumed their journey to Caesarea-Philippi, arriving late that evening and stopping at the home of Celsus, who was expecting them. The apostles slept little that night; they seemed to sense that a great event in their lives and in the work of the kingdom had transpired. 157:4.1 Since the occasions of Jesus' baptism by John and the turning of the water into wine at Cana, the apostles had, at various times, virtually accepted him as the Messiah. For short periods some of them had truly believed that he was the expected Deliverer. But hardly would such hopes spring up in their hearts than the Master would dash them to pieces by some crushing word or disappointing deed. They had long been in a state of turmoil due to conflict between the concepts of the expected Messiah which they held in their minds and the experience of their extraordinary association with this extraordinary man which they held in their hearts. 157:4.2 It was late forenoon on this Wednesday when the apostles assembled in Celsus' garden for their noontime meal. During most of the night and since they had arisen that morning, Simon Peter and Simon Zelotes had been earnestly laboring with their brethren to bring them all to the point of the wholehearted acceptance of the Master, not merely as the Messiah, but also as the divine Son of the living God. The two Simons were well-nigh agreed in their estimate of Jesus, and they labored diligently to bring their brethren around to the full acceptance of their views. While Andrew continued as the director-general of the apostolic corps, his brother, Simon Peter, was becoming, increasingly and by common consent, the spokesman for the twelve. 157:4.3 They were all seated in the garden at just about noon when the Master appeared. They wore expressions of dignified solemnity, and all arose to their feet as he approached them. Jesus relieved the tension by that friendly and fraternal smile which was so characteristic of him when his followers took themselves, or some happening related to themselves, too seriously. With a commanding gesture he indicated that they should be seated. Never again did the twelve greet their Master by arising when he came into their presence. They saw that he did not approve of such an outward show of respect. 157:4.4 After they had partaken of their meal and were engaged in discussing plans for the forthcoming tour of the Decapolis, Jesus suddenly looked up into their faces and said: "Now that a full day has passed since you assented to Simon Peter's declaration regarding the identity of the Son of Man, I would ask if you still hold to your decision?" On hearing this, the twelve stood upon their feet, and Simon Peter, stepping a few paces forward toward Jesus, said: "Yes, Master, we do. We believe that you are the Son of the living God." And Peter sat down with his brethren. 157:4.5 Jesus, still standing, then said to the twelve: "You are my chosen ambassadors, but I know that, in the circumstances, you could not entertain this belief as a result of mere human knowledge. This is a revelation of the spirit of my Father to your inmost souls. And when, therefore, you make this confession by the insight of the spirit of my Father which dwells within you, I am led to declare that upon this foundation will I build the brotherhood of the kingdom of heaven. Upon this rock of spiritual reality will I build the living temple of spiritual fellowship in the eternal realities of my Father's kingdom. All the forces of evil and the hosts of sin shall not prevail against this human fraternity of the divine spirit. And while my Father's spirit shall ever be the divine guide and mentor of all who enter the bonds of this spirit fellowship, to you and your successors I now deliver the keys of the outward kingdom—the authority over things temporal—the social and economic features of this association of men and women as fellows of the kingdom." And again he charged them, for the time being, that they should tell no man that he was the Son of God.